Paying your taxes can be a bummer, so reward yourself this April 18 by taking advantage of some FREE offers! 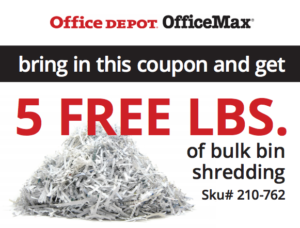 OfficeMax and Office Depot is offering up to 5 pounds of bulk bin shredding for FREE with this coupon through April 29th. With tax time coming up fast this is a great deal. Bruegger’s Bagels Enjoy a Big Bagel Bundle (any 13 bagels and two tubs of cream cheese) for just $10.40 from April 14 to April 19. Claim the offer at Brueggers.com. Boston Market On Tuesday, April 18, any guest who dines in-restaurant can purchase a $10.40 Tax Day Meal Special. Offer includes a Half Chicken Individual Meal with 2 sides, cornbread, a regular fountain beverage and a cookie. Chili's Toast another IRS-free 12 months at Chili's while it offers its blueberry and pineapple margaritas for just $6 all day on April 18. Dickey's BBQ Pit Free dessert with $10 minimum purchase when you present this coupon! Hooters: Kids eat free at select locations on April 17 and 18 with the purchase of $10 or more by an accompanying adult. 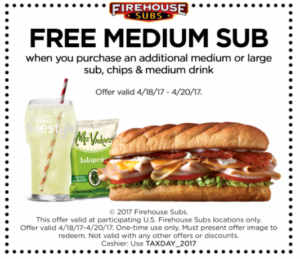 Firehouse Subs is inviting guests to stop by to receive a free medium sub with the purchase of a medium or large sub, chips and a drink (valid April 18 - April 20). 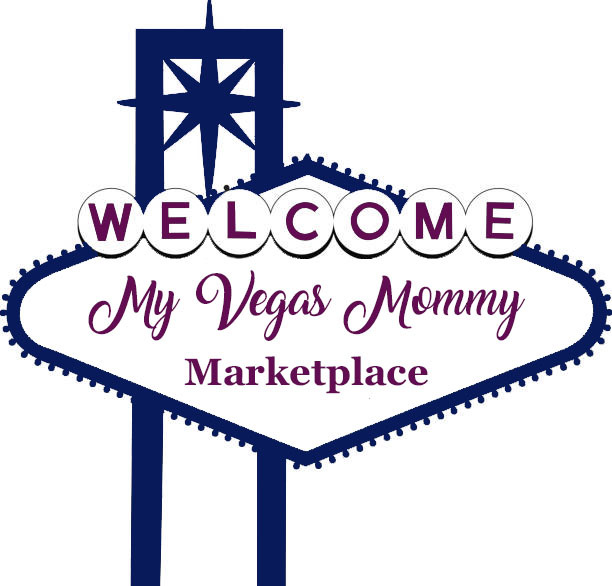 To redeem, guests may print or show the offer on their phone. Schlotzsky’s On April 18, swing by your local Schlotzsky’s to get a free small The Original with the purchase of a medium drink and a bag of chips. Sonic On April 18, Sonic Drive-in is giving taxpayers some relief by offering cheeseburgers at 50% off at participating locations. Use this coupon to get a free HydroMassage experience from April 15 through 22. When customers spend $25 or more in store, they are given a code to enter on their receipt. The selected winners (two winners) will win three times their tax return or the amount they owe, which is a chance for customers to reward themselves with extra $$ on top of their refunds (min $2,000 and max up to $15,000).